Hello. I think I’ve said it before, but I just wanted to remind you that you’re easily my favourite reader. All the others are okay-ish I suppose, but you’re easily the best. Keep it to yourself though. Mum’s the word. Flagging towards the end of a run, I groaned as I realised the last mile was pretty much all uphill. How could that be? This bit had definitely been downhill when I’d come the other way earlier. Childish imagination to the rescue! As I struggled to haul myself up the hill, my imagination conjured up a shining golden line which shot forth from my belly button like a heavenly umbilical-cord grappling-hook**. The imaginary line harpooned a tree up in the distance and I then began to reel it back in like the automatic cable thingy in a vacuum cleaner, pulling myself forwards and taking some of the effort away from my tired little legs. I should stress that at no point did I think that any of this was actually happening. I’m not weird or anything. This is another one that I popped into my head while I was feeling sorry for myself on a particularly heavy-legged run. I started to imagine that certain things would give me “power ups” like in a video game. So, stepping on a manhole cover would leave me radiating with a shimmering golden aura***, filling me with the energy I needed to carry on running. Every time I ran past a lamp-post I’d borrow some of the electricity in the form of cartoonish lightning bolts crackling around me, again breathing placebic life into my aching legs and giving me a surge of speed. A side effect of these power ups was that they did give me an insatiable desire to chase tiny colourful ghosts around a maze. So, that’s a couple of tricks I’ve used to pass the time while running and to fool myself into forgetting the tiredness for a few moments. 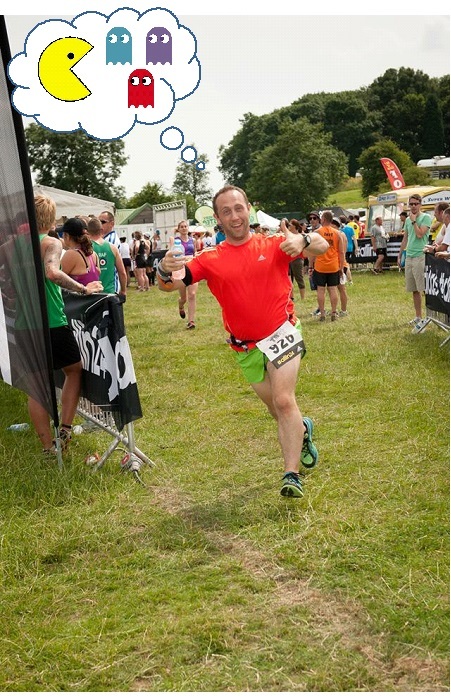 If any of you use your imagination to pull you through the harder runs I’d love to hear about it. If only to reassure me that I’m not the only oddball on the planet. Do you think the elite runners ever use techniques like this? I wonder if Paula Radcliffe spends her tempo runs imagining she’s being chased by a swarm of cannibalistic smurfs; a tidal wave of gnashing teeth and adorable hats. * I’m not very good at history. ** There’s a phrase that doesn’t get used nearly enough these days. *** Or just send me plummeting down into a sewer. I always knew I was your favorite…. Ah, and now you’ll have the bonus of a pretend tow-rope grappling hook thingy to help you along. I’m heading out now. I’ll let you know how it goes! I wear black and pretend I’m a ninja… ninjas are fast, right? It went a little far in the woods the other day when I imagined I was being followed by ghosts – I started to believe it and managed to scare me out of my own wits. Maintained a good pace, mind, and surely that’s what really matters? “I pretend I’m a ninja”. That’s exactly the sort of thing a ninja would say. Loving these totally sensible blogs, followed by equally sensible comments 😉 they are my bible for a good running technique. I’m off to buy a black ski mask now, in order to pursue my dream of running ‘fast like ninja’. My usual method of running fast was to find the biggest dog I could, and veer dangerously close whilst screaming ‘cat!!! !’ at the top of my lungs. Sure does give you that burst of speed, whether it’s the dog or an irate owner chasing you…. He he, I love the “power up” idea! I will definitely be using that one, once my pesky ITB calms the **** down.